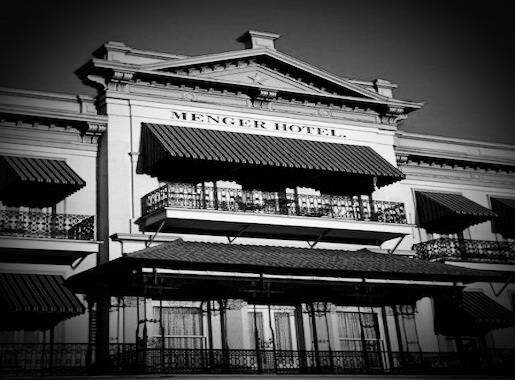 Widely regarded as the ‘Most Haunted Hotel in Texas’, the Menger Hotel in Alamo, TX, is reportedly home to as many as 32 ghosts. Although none have been reported as threatening, you may come in to contact with them as they pleasantly go about their daily business. Of all the ghosts that continue to reside at the Menger, the most high profile has to be former President Teddy Roosevelt. It was here at the Menger, at the Menger Bar, where he would convince unsuspecting cowboys to join his detachment of Rough Riders over a free drink (or a few!). Before they had time to sober up, they found themselves on the way to Fort Sam Houston for military training, before joining up with the forces fighting the Spanish American War. It is here at the very bar he used for canvassing, where his apparition has been seen, often sitting at the bar enjoying a drink! The most often reported sighting is a woman called Sallie White. She was a chambermaid at the hotel during Victorian times who, after during her work shift, was attacked by her husband. Suffering from severe injuries, she tragically lost her life days later. According to the Menger Hotel records, it paid for her funeral at a cost of $32.00. You may see Sallie during the night on the way back to your room, in her Victorian maid outfit, carrying a handful of towels for guests. Another apparition that as been witnessed in the hotel is that of Captain Richard King. He was the owner of one of the biggest ranches in the world – The King Ranch. He would often stay at the hotel during his lifetime, as he had his own personal suite. After being informed of his impending death by his physician, he spent the last few months of his life in his suite, writing his will, and bidding farewell to his friends. His funeral was even held in the parlor of the hotel. His suite, now named the “King Ranch Room”, is where his ghost has been seen. Entering the room where the door was once located before the room was remodelled. Another apparition of woman has been seen in the original hotel lobby. On one occasion a staff member witnessed a woman in an old-fashioned blue dress sat knitting in the old lobby. Approaching her, the staff member asked if she was okay and if there was anything she needed, only she answered with a stern “No”, disappearing shortly after. A male entity has been witnessed by a guest who was getting out of the shower. Emerging from the shower, the guest to saw a man dressed in a buckskin jacket and grey pants, seemingly arguing with an unseen presence. “Are you gonna stay, or are you gonna go?”, he was reported as saying, three times before he vanished! There have also been reports of helpful ghosts in the kitchen. With staff members often reporting utensils floating through the air from one area to another. Due to the location of the hotel (facing the site of the Alamo), many of the reports can be attributed to the lives that were lost here. One of the most frequent reports is the sound of heavy footsteps and the sighting of old military boots. This is just a fraction of the reports that have occurred here, although all are seemingly friendly, with the only terrifying aspect of them being their sudden appearance, startling guests and staff alike. The Menger Hotel was built in 1859 by William Menger, under the guidance of architect John Fries. It was widely renowned as the grandest hotel west of the Mississippi, playing host to several important guests including Sam Houston, Generals Lee and Grant, and Presidents McKinley, Taft, Eisenhower, and Roosevelt, as well as Babe Ruth, and Mae West. It rose to prominence as the best hotel in the South West, after the Civil War had ended and various additions were made, as well as the new rail road that arrived in 1871. It was renowned for its fine cuisine, which included specialities such as snapper soup, which was made from turtles caught in the San Antonio River. Further additions were made in the 1880’s, with a new bar being installed, designed as a replica of the Lords Club in London, England. In 1909 the hotel was enlarged again, with additions to the south side, and continued to attract high members of society. It declined during the Great Depression, but was renovated in the 1940’s. By 1951, the hotel had been completely renovated and modernized. In 1976, the Menger was included in the National Register of Historic Places, as part of the Alamo Plaza Historic District. Located adjacent to the Alamo, the handsome Menger Hotel has played a central part in the history of San Antonio for over 150 years. Since its construction in 1859, the hotel has been enlarged several times, expanding to 316 guest rooms and suites. The original wrought-iron balconies are still a redeeming feature of the property. It boasts San Antonio’s largest heated indoor swimming pool, a full service spa, and fitness room, and one of the city’s most highly respected restaurants. The majority of the room sin hotel overlook the Alamo, pool, or Alamo Plaza, with all retaining the original period features of its past, such as four poster beds, and velvet-covered Victorian chairs, marble topped tables, and wall coverings. With the Menger’s location, adjacent to the Alamo, and RiverCenter Mall, it’s ideally located for both historic and modern amenities that San Antonio has to offer. If you’d like to experience the beautiful sights in the area, the famous Riverwalk is just a short walk away, with the Convention Center, Hemisfair Park, San Antonio Botanical Garden, San Antonio Zoo, and the Tower of Americas also just a short walk away. If you are a fan of history and culture, the Menger Hotel is ideally located for visits to San Antonio Museum of Art, the Witte Museum, El Mercado, Museo Alameda, Lila Cockrell Theatre, Majestic Theatre, Buckhorn Museum, and numerous Spanish missions. For those vacating with children, the San Antonio Children’s Museum, Magik Children’s Theatre, Sea World San Antonio, and Six Flags Fiesta Texas are all recommended. Standard room daily rate (based on 2 people sharing) from $100.00. However, prices change on a daily basis based on availability. To get the very latest prices please click here.